Video of CERN's scientific Higgs seminar and the follow-up press conference screened live via a dedicated connection for Fermilab employees, users, friends and family. Pajamas optional. CERN also offers a public webcast. Higgs all-hands meeting on Thursday, July 5, at 9 a.m., CERN scientific presentations, Wednesday, July 4, at 2 a.m.
At 9 a.m. on Thursday, July 5, in Ramsey Auditorium, Fermilab COO Bruce Chrisman will lead a 30-minute non-technical briefing on the Higgs boson. Fermilab scientists Rob Roser and Dan Green will explain in plain language why the Higgs has been in the news this week, the meaning of the LHC and Tevatron results, and why the Higgs is important. Following the all-hands meeting, coffee and bagels will be provided in the Wilson Hall cafeteria. Fermilab scientists will be present to answer questions. Tomorrow at 2 a.m. in One West, video of CERN's scientific Higgs seminar and the follow-up press conference will be screened live via a dedicated connection for Fermilab employees, users, friends and family. Pajamas optional. CERN also offers a public webcast. Physics takes center stage in three plays being premiered in St. Charles this month. Beginning this Saturday, Fox Valley Repertory will bring Collider 2012, a series of staged readings of science-themed plays, to Chicago-area audiences. Taking advantage of its proximity to Fermilab, the theater company called on a few Fermilab scientists to partner with the playwrights toward the final stages of production, helping to bring a thorough scientific understanding to bear on the stories. The partnership also gives the scientists a chance to observe the choices a playwright makes in telling a science story. “We wanted it to be a shared process,” said John Gawlik, Collider 2012’s artistic director. “Scientists and playwrights ask similar questions about who we are in the universe, but come at it from very different perspectives.” As the writer and scientist discuss the story, perspectives shift, helping point the way for more compelling science narratives. Fermilab scientist Elizabeth Buckley-Geer, one of Collider 2012’s volunteer scientists, worked with writer Gloria Bond Clunie on her play, “Quark,” to bring realism to the science. She took Clunie on a tour of Fermilab. The science-writer collaboration also helps produce a work where the science and story intersect at more than just one point. 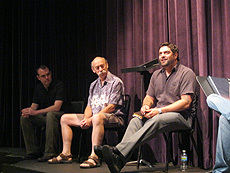 After the readings, audience members are invited to share their thoughts and ask questions of the cast, playwrights, directors and scientists. This year’s Collider playwrights, who come from as far away as North Carolina, may then use the post-performance discussions to tune their scripts even further. The Collider 2012 staged readings take place on Saturdays July 7, 14 and 21 at 1 p.m. at the Fox Valley Repertory theater, located at Pheasant Run Resort. They are free (suggested donation of $10) and open to the public. The July online-only issue of symmetry magazine is now available here, featuring stories on SLAC's new FACET test bed, a physicist researching national energy efficiency standards, an explanation of the meaning of sigma and much more. 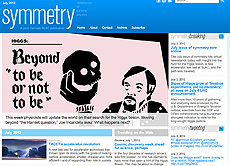 To get future issues delivered directly to your inbox once a month, subscribe to the symmetry email update list. Like Moses seeing the Promised Land but not being able to go there, physicists from Fermilab said Monday that its Tevatron, now shuttered but once the most powerful physics machine in the world, had fallen just short of finding a long-hypothesized particle. Known as the Higgs boson, it explains why things in the universe have mass, and is a cornerstone of modern physics despite never being seen. The news from the Fermi National Accelerator Laboratory added more buzz and hype about the long-sought particle as physicists and many others are standing by for an announcement on Wednesday from CERN, the European Organization for Nuclear Research, home of the Large Hadron Collider, which supplanted the Tevatron as the big horse in physics, and whose physicists might be on the verge of announcing that they have actually found the Higgs boson. On Monday, Fermilab, in Batavia, Ill., said its results were the best "indication" so far that the legendary particle exists. American scientists have found strong hints that the rumored Higgs boson particle exists, and has been created inside an atom smasher in Illinois. The news comes just days before big news on the search for the Higgs is expected to be delivered by physicists from the world's largest particle accelerator, the Large Hadron Collider (LHC). "This is a very exciting week — it may be the most exciting week in physics since I became a physicist," Joe Lykken, a theoretical physicist at the Fermi National Accelerator Laboratory (Fermilab) in Batavia, Ill., said during a news conference today (July 2). The Higgs boson, also called the "God particle," is thought to explain why other particles have mass. The idea is that a related energy field, called the Higgs field, permeates space, and that as particles pass through this field their interactions with it confer mass on them, like a spoon being dragged through molasses. I arrived in Australia a couple of days before the start of the International Conference on High Energy Physics to find articles in the newspapers predicting a "Big Bang" on July 4 when the latest Higgs results from the LHC will be presented at CERN. I and my fellow ICHEP attendees will watch the joint CMS and ATLAS seminar via a webcast. Many scientists will gather at Fermilab at 2 a.m. to watch the same webcast and start their Independence Day celebrations very, very early. 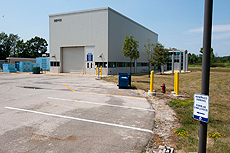 There is great anticipation here at Melbourne, at Fermilab and across the world for what will be revealed this week. Yesterday we presented the final Tevatron's Higgs search results. DZero and CDF confirmed the strong hints we have had so far from both the Tevatron and the LHC but the results were not statistically significant enough to claim a Higgs discovery. While a discovery wasn't in the cards for the Tevatron, yesterday's results are still very important because they measure the Higgs as it decays to bottom quarks, a mode that is much more difficult to measure at the LHC. The LHC experiments have collected twice as much data since their last Higgs-search update; will they announce a more definitive result on Wednesday? While we wait to hear what answer the LHC scientists have for us, it's a good time to reflect on how much the global particle physics community has to be proud and thankful for. The Tevatron discoveries, advances in technology and analysis methods have been well documented and recently celebrated. If the Higgs is there, the fact that the CDF and DZero experiments got as close as they did is extraordinary. The proton-antiproton collisions created at the Tevatron were very difficult to achieve, and no one ever expected the Tevatron to reach the high luminosities that made these latest results possible. Likewise, no one anticipated the great ingenuity of the scientists from the international Tevatron collaborations. They extracted more important physics out of their datasets than anyone expected, from the Higgs-search results, to the precision measurements of the top quark and the W boson, to the many exciting measurements in flavor physics. The LHC is an extraordinary machine, running at a luminosity that already exceeds design specifications. The detectors of the LHC are marvels of technology and international collaboration. The performance of these detectors early in their lives has allowed sensitive searches for new phenomena, none more dramatic than the search for the Higgs. No matter when the decades-long Higgs hunt reaches a definitive conclusion - this week or later this year - it will be a truly momentous occasion that all the world's particle physicists will celebrate. This achievement will be due to the great technical skill at CERN, the strong European support for CERN and the global collaboration that the LHC has enabled and that we all benefit from. As part of this global collaboration, Fermilab and more than 90 other US national labs and universities have made major contributions to the LHC accelerator and its detectors with support from DOE and NSF. A large fraction of the US particle physics community is now focused on the discovery opportunities at the LHC and have been critical components of the experiments' Higgs searches. And once we've heard the ATLAS and CMS results it will be important to remember that the LHC is still in its infancy. If the Higgs is there, with the hundreds of times greater luminosity that will be gathered in the coming years, it will be possible to study this new particle in great detail. Is it the Higgs that we all expect and love, or does it behave in different and unexpected ways? Are there other particles out there waiting to be found? New vistas for particle physics may be just around the corner! After working for over 35 years supervising the production of the Tevatron magnets and devices and managing the Industrial Center Building, Gary Sliwicki is retiring from Fermilab. His last day is July 12. After retiring, Sliwicki plans to enjoy the lake, go fishing and relax. Fermilab's Roads and Grounds Department has outlined five parking spots between the Minos Surface Building and the NOvA near-detector building. Fermilab personnel are allowed to park in these spots, which are next to the oil tank, in order to access the Minos/NOvA areas. Parking is not permitted in the rest of the parking lot as other construction vehicles will use this space. Users are encouraged to carpool or park at the Lederman Education Center and walk over. Roads and Grounds has also mowed a path for walkers. Those who are in the parking lot outside these five spaces or in the Minos high bay must wear a hard hat, safety glasses, vest, long pants, sleeved shirt and construction shoes. At this Friday's Joint Experimental-Theoretical Seminar, James Degenhardt, University of Pennsylvania, will give a talk titled "New results from ATLAS: W'/Z' and MSSM Higgs searches." A joint ATLAS/CMS seminar on the latest Higgs results will take place at a later date. Outdoor soccer - Tuesdays and Thursdays at 6 p.m.